The next time you’re tempted to tighten your horse’s noseband just one more hole, you may want to think twice. According to a recent study by an Australian research team, excessively tight nosebands not only could be stressful but even harmful to a horse’s welfare. The study assessed the relationship of noseband tightness on oral behaviors (licking, chewing, yawning) and stress behaviors (as indicated by heart rate, heart-rate variability and eye temperature). Researchers used a dozen horses of various ages, breeds, heights and gender. The horses wore double bridles with padded crank nosebands, a combination often seen in higher level dressage. A double bridle has both a curb bit and bridoon (a narrow, single- jointed snaffle bit) plus a curb chain. 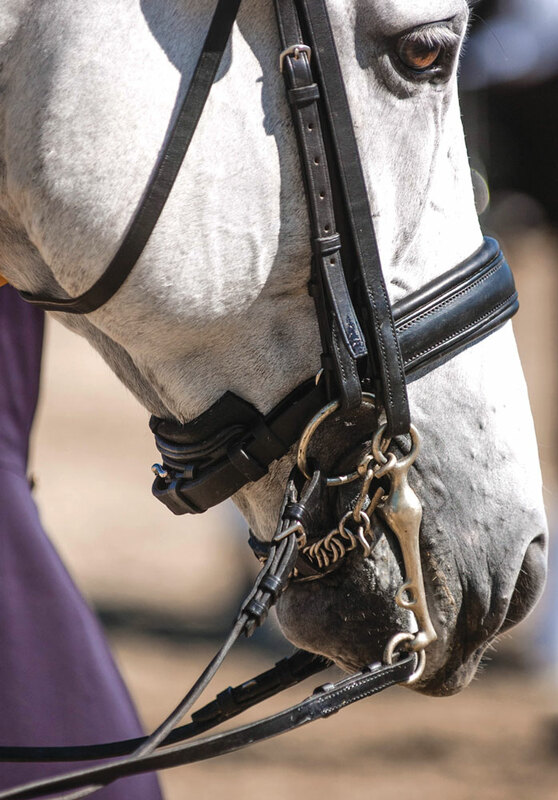 A crank noseband has a leveraged buckle that allows for a tighter fit than a plain cavesson. To avoid the influence of previous exposure, the study used only horses who had never worn a double bridle or a crank noseband before. During the study, horses were assigned to one of four research groups each day based on tightness of the noseband: unfastened noseband; conventional area under noseband, specifically, two fingers of space; half conventional area under noseband, specifically, one finger of space; or no area under the noseband. Each horse experienced each tightness level once over four consecutive days. A heart-rate monitor girth and a video camera were used to record the horses’ reactions during three 10-minute sessions: baseline (noseband not tightened), treatment (noseband tightened according to horse’s group) and recovery (bridle removed). Researchers found that horses wearing the tightest nosebands demonstrated stress reactions, including significant increases in heart-rate and eye temperature, a significant decrease in heart rate variability and cessation of licking. Horses in all groups also showed a post-inhibitory rebound response during recovery. Essentially, this happens when the horse experiences a period of restriction and afterward shows an increase in a behavior compared to baseline. It indicates that a horse’s welfare has been compromised during the period of restriction. For instance, after showing reduced chewing with nosebands on, the tightest groups showed a significant increase in chewing during recovery. The loosest group showed much less chewing during recovery, suggesting that these horses felt less deprivation during the test phase. Yawning, swallowing and licking all increased during recovery, compared to the baseline, for all groups. Overall, study results suggest that very tight nosebands may cause stress and/or pain and may prevent a horse from performing normal oral behaviors often associated with comfort. However, researchers noted that horses may have been reacting not only to noseband tightness but also to the unfamiliarity of wearing two bits.